Buffalo has developed a new web access facility for users of its LinkStation Live networked external hard drive. The free online service allows you to instantly and securely access all your digital files stored on the product situated at home, with an internet connection. "Consumers rarely restrict themselves to using just one computer, and considering the vast amounts of digital files, such as photos, films and music, that are stored in homes across the world, why should users be constrained in accessing it?" said Gerardine Lynch at Buffalo. "The LinkStation Live allows users to store, share and stream digital content in the home, while the new Web Access tool delivers the same capabilities whether users are at home, work or in an internet café in Australia." You can log on to the Buffalo NAS (network attached storage) site from anywhere in the world. By entering the registered name of the LinkStation, you can immediately connect to your digital content. You can then choose to download files, stream MP3s and videos, play all MP3s in a playlist or share the content by sending a link and login information to a friend. It supports UPnP (Universal Plug and Play) and has optional SSL (https) encryption to ensure security. Users can also restrict public access so that only designated people can open selected files. The new facility is available immediately to existing LinkStation Live users via a free firmware upgrade and will be installed on all LinkStation Lives from June. 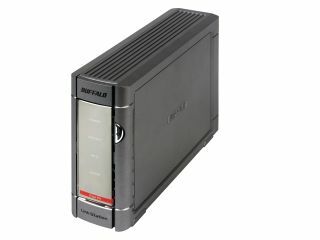 It will soon be compatible with other Buffalo NAS devices, such as the TeraStation Live.